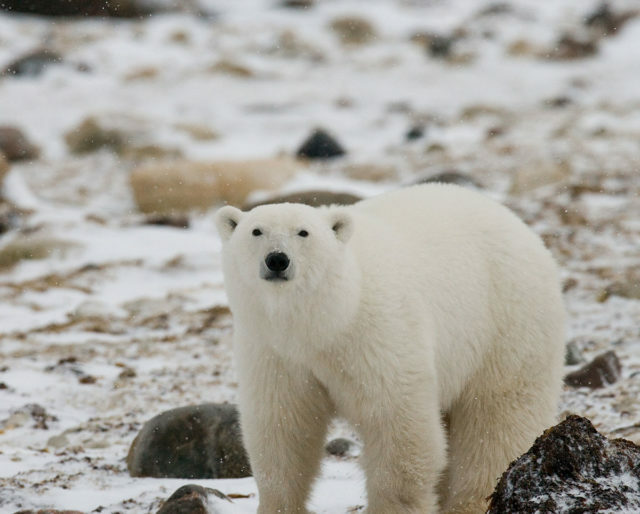 Polar bears are some of the coolest creatures on the planet, and they live in some of the coldest places on Earth. Each year on February 27 we celebrate these magnificent creatures on International Polar Bear Day. The day was established by Polar Bears International, an organization devoted to preserving polar bears and the sea ice they depend on, to draw global attention to the plight of these magnificent mammals. Polar Bears International, the organization that started International Polar Bear Day, encourages friends of polar bears to celebrate by taking part in their Thermostat Challenge by lowering their thermostats on February 27 to reduce carbon emissions (and help the polar bears). What better way to celebrate International Polar Bear Day than to see one of these exceptional creatures in action. Check to see if your local zoo features a polar bear exhibit (just a few examples that do: the Bronx Zoo in New York, the San Diego Zoo, and the Oregon Zoo). No polar bears nearby? Checkout highlights from Explore.org’s live cams. Coca-Cola helped polar bears capture our hearts. Polar bears and Coca-Cola seem to have been inseparable since time immemorial—but actually, the relationship began with a French Coca-Cola ad in 1922. By humanizing the polar bear, Coca-Cola made an otherwise scary predator accessible to millions. So crack open a Coke, and say a toast to the best bears. Polar bears are exceptional animals. Here’s just one reason to love them: their iconic white coat isn't actually white at all—it's transparent. Polar bears are covered in a thick layer of clear, air-filled fur that luminesces in the light. Underneath all that hair is black skin designed to absorb the warmth of sunlight. Polar bears may look chubby and lazy, but don't be fooled. The largest land carnivores on Earth are able to swim up to 60 miles at a single stretch—without rest—in search of food. Polar bears live in the Arctic areas of the northern hemisphere, which are being threatened by loss of sea ice from global climate change. Two-thirds of the planet’s polar bears could be gone by 2050, and scientists estimate the bears could be extinct by 2100.